The most important quality a fishing kayak should have is stability and the Lifetime Sport Fisher Kayak has got a lot of it. Referring to it as the 'most stable kayak in the world' is not far-fetched. You can fish while seated, sit sideways and extend your legs into the water, sit cross-legged, and even cast while standing up and it won't tip over or feel like it is going to. 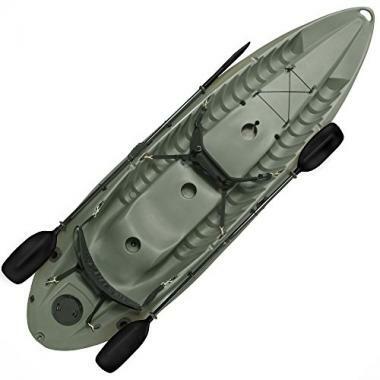 With a 500 pounds weight capacity, it is great as a family or a tandem fishing kayak. It will comfortably accommodate two adults and still have space for a kid or a four-legged friend. It has the storage capacity an angler needs to store their fishing gear and catches and is adequately geared for fishing straight from the package. It comes with fishing rod holders and has a dedicated place for a trolling motor. This review looks at everything the Lifetime Sport 10' Fisher has to offer including its shortcomings. Read on to discover what makes it a great fishing kayak and whether it offers what you're looking for. The hull is blow molded from high-density polyethylene for strength and durability. UV protection ensures the shell doesn’t peel, fade or crack. The hull design gives the Lifetime Sport Fisher its excellent stability while ensuring it also has great tracking. Storage and attachment options include a rear storage hatch, fishing rod holders, bungees, ditty trays, paddle cradles, and shock cord straps. There is plenty of room to stash and attach fishing accessories such as a fishing cooler and personal gear such as a life jacket and drinks. The Sport Fisher has seating space for up to three. There are two ergonomic seats for the paddlers and a third molded-in seat for a third person to sit side-on. Multiple molded footrest positions accommodate paddlers of all heights. It is customizable and equipped with holes and mounts. There is a place for a trolling motor and Lifetime offers a rudder, a sail, and a trolling motor mount for sale separately. Other features include scupper holes for draining water from the cockpit area and molded carry handles at the front and rear. Accessories: 2 Paddles, 2 padded backrests, 3 fishing pole holders, paddle clips, and extra scupper plugs. Ease of Handling: 10 feet long, 3 feet wide and 60 pounds heavy, the Lifetime Sport Fisher Kayak is awkward for one person to handle, even with the in-built carry handles. It is possible for a strong person to lift it and load it onto a vehicle single-handedly but more than one pair of hands is needed to load it in and out of a vehicle easily. Practicality: As a single kayak, this is the perfect fishing platform even for big guys. As a tandem kayak, sitting inside the boat and casting at the same time and in the same direction can be awkward but the good thing is that this kayak has the stability to enable anglers to fish how they want. One can fish sideways with legs extended into the water to enjoy the coolness, sit backward, sit cross-legged and even cast while standing up. When fishing with two people on it, casting in turns or sitting sideways with feet dangling in the water makes casting and other angling movements and actions easier. The Sport Fisher is designed for fishing in rivers, ponds, and lakes. It is meant for calm waters but can also handle wavy, choppy waters well should the situation call for it. Comfort: One of the most stable kayaks on the market, the Sport Fisher is a comfortable water vessel. There is a lot of leg room and space in the seating area for it to be a luxurious sit on top kayak for a single paddler. It also offers adequate room for two adults seated closed together. Multiple footrest positions offer comfort to paddlers of all heights. Seating comfort is where the Sport Fisher fails. Even though the kayak comes with two padded backrests, lack of cushioning on the seats means that long hours of sitting and paddling, casting, waiting and retrieving are going to be excruciating. We recommend getting more comfortable kayak seats, As most owners of this kayak have done. Stability, Tracking and Speed: Stability is where this kayak shines. Many kayakers say the Lifetime Sport 10′ Fisher is the most stable kayak they’ve ever been in. It’s got excellent initial and secondary stability. Whether there are three people on board or just one big guy, it is a stable fishing vessel. There is no feeling like it is going to tip over when getting in or out, maneuvering it, or landing and fighting a trophy catch. It is very hard to turn it over and it is also designed to float in the event that it capsizes. It is easy to paddle and control and stops pretty quickly and quietly when one stops paddling. Maneuvering it is easy as it turns on a dime. It tracks surprisingly well for its length and paddlers don’t have to exert a lot of effort to get it to go where they want. Tracking can be an issue when there’s strong wind or current. The good thing is that the kayak also allows for attaching a rudder or trolling motor to transform it into a fishing machine. While the design and dimensions of the Lifetime Sport 10′ Fisher make it the most stable kayak, this is at the expense of speed. It is no speedboat but its leisurely speed is okay given that it is a fishing/sportsman recreational style kayak. For its intended use, it is still fast enough to cover a lot of water in no time. 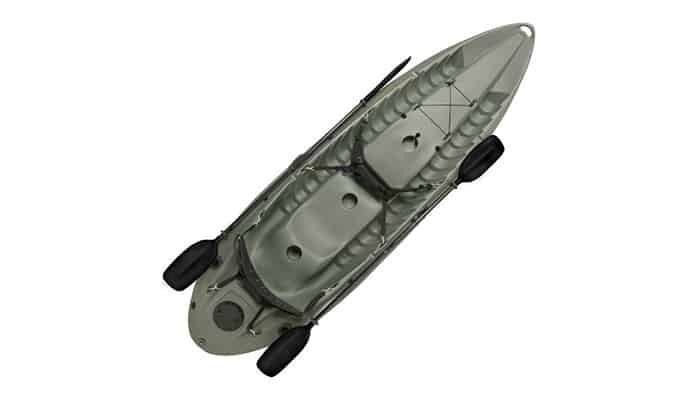 Material: 95% – Rotomolded construction using high-density polyethylene makes the Sport Fisher an incredibly tough kayak that can function with a 500 pounds load on board. This is a great choice of material that can withstand rough handling and frequent dings against rocks and this kayak will last many fishing seasons. The manufacturer has guaranteed this with a five-year warranty. Design: 95% – The design of the Lifetime Sport Fisher Kayak is perfect for its use as a fishing/sportsman kayak. The hull shape, length, and width give it excellent stability while ensuring that kayakers won’t have a hard time getting the kayak to track straight. It is also equipped with well thought out features such as a place for a trolling motor mount, fishing pole holders, and plenty of storage options. Price: 95% – The Lifetime Sport Fisher is reasonably priced and owners consider it a good value for money and a smart purchase. This is true when you consider its build quality, stability, performance, and the accessories it comes with. Overall: 95% – This is an accessibly priced kayak that has quality, strength, and durability. It is built to offer a lot of stability, equipped with plenty of storage room, and has a huge payload. The Lifetime Sport Fisher is definitely one of the best fishing kayaks for one person, two people or a family of three. At its price, you won’t find another vessel that fishes as well as it does. One of the most stable kayaks, the Lifetime Sport Fisher Kayak is an excellent fishing kayak. With its stability and a payload of 500 pounds, it is a great choice if you’re looking for a tandem fishing kayak or a family kayak that will accommodate two adults and a kid or two adults and a four-legged companion. It is also a perfect platform for plus-sized kayakers and for beginners and intermediate users. The Lifetime Sport 10′ Fisher is also a versatile boat and great as a leisure kayak for camping trips and cruising leisurely as a family or with one or two friends. If you want a fast cruising vessel that can race at top speed, this is not the kayak for you. A sit in kayak or a touring sit on top touring kayak will suit you better. Does the Lifetime Sport 10′ Fisher sound like the perfect kayak for you? Let us know your thoughts in the comment section below. The most important quality a fishing kayak should have is stability and the Lifetime Sport Fisher Kayak has got a lot of it.